Powerlessness: Perception that one’s own action will not significantly affect an outcome; a perceived lack of control over a current situation or immediate happening. Patients who are enduring powerlessness may seem like they have no control over their situation and may act out with indifference, anger, violent behavior, or passivity. Also, patients who are suffering from chronic, debilitating, or terminal illnesses may have continuing perception of powerlessness because they are incapable of changing their inevitable outcomes. Older patients are particularly vulnerable to loss of control and progressing dependence that occurs with aging, as well as the results of weakness, sickness, and affliction. 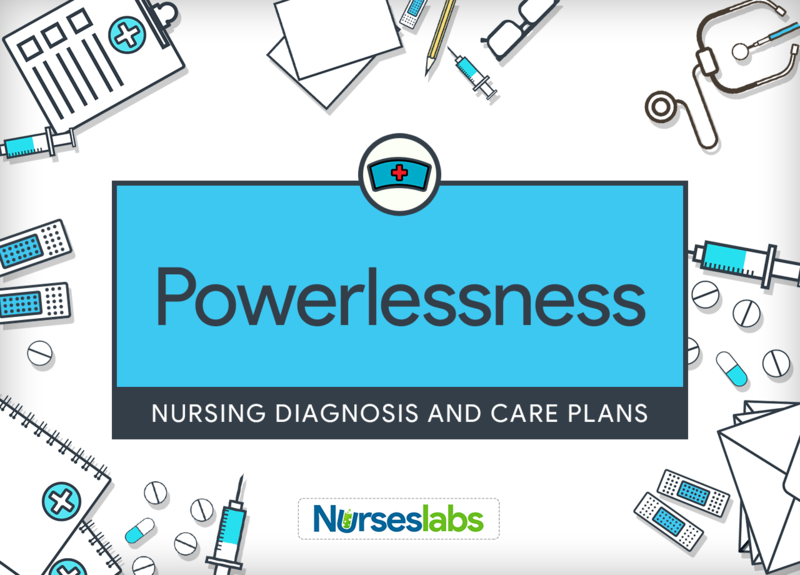 Powerlessness may be displayed at any time during the patient’s illness and may be observed in the hospital, ambulatory care, rehabilitation, or home environment. Patient expresses sense of personal control. Patient displays content with life choices. Patient recognizes means to control over personal situation. Patient makes choices free from undue stress from others. Assessment is needed in order to identify possible problems that may have lead to Powerlessness. Assess for feelings of apathy, hopelessness, and depression. These moods may be an element of powerlessness. Determine the patient’s power needs or need for control. Patients are usually able to recognize those perspectives of self-governance that they miss most and that are relevant to them. Distinguish the patient’s locus of control. The extent to which people associate responsibility to themselves (internal control) versus other forces (external control) determines the locus of control. Patients with a predominantly external locus of control may be more susceptible to feelings of powerlessness. Evaluate the patient’s decision-making competence. Powerlessness is the feeling that one has lost the implicit power to control their own interests. Know situations/interactions that may add to the patient’s sense of powerlessness. It is necessary for healthcare providers to recognize the patient’s right to refuse to certain procedures. Some routines are done on patients without their consent fostering a sense of powerlessness. Appraise the impact of powerlessness on the patient’s physical condition (e.g., appearance, oral intake, hygiene, sleep habits). Individuals may seem as though they are powerless to establish basic aspects of life and self-care activities. Assess the role of illness plays in the patient’s sense of powerlessness. The dilemma about events, duration and course of illness, prognosis, and dependence on others for guidance and treatments can contribute to powerlessness. Note if the patient shows a need for information about illness, treatment plan, and procedures. This request for information will help the nurse distinguish powerlessness from knowledge deficit. Evaluate the results of the information given on the patient’s feelings and behavior. A patient facing powerlessness may overlook information. Too much information may overwhelm the patient and add to feelings of powerlessness. A patient simply experiencing a knowledge deficit may be mobilized to act in his or her own best interest after information is presented and options are explored. The act of providing infomation may strengthen a patient’s sense of independence. Encourage verbalization of feelings, thoughts, and concerns about making decisions. This approach creates a supportive environment and sends a message of caring. Encourage patient to identify strengths. This will aid patient to recognize inner strengths. Discuss with the patient concerning his or her care (e.g., treatment options, convenience of visits, or time of ADLs). Allowing the patient to participate in discussions will increase his or her sense of independence or autonomy. Encourage an increased responsibility for self. The perception of powerlessness may negate the patient’s attention to areas in which self-care is attainable; however, the patient may require significant support systems and resources to accomplish goals. Help the patient in reexamining negative perceptions of the situation. The patient may have his or her own perceptions that are unrealistic for the situation. Eliminate the unpredictability of events by allowing adequate preparation for tests or procedures. Information in advance of a procedure can provide the patient with a sense of control. Give the patient control over his or her environment. This approach enhances patient’s independence. Aid the patient in recognizing the importance of culture, religion, race, gender, and age on his or her sense of powerlessness. Patients may develop powerlessness especially in a hospital environment when they don’t speak the dominant language, food is unusual, and customs are different. Support in planning and creating a timetable to manage increased responsibility in the future. Use of realistic short-term goals for resuming aspects of self-care foster confidence in one’s abilities. Avoid using coercive power when approaching the patient. This approach may increase the patient’s feelings of powerlessness and result in decreased self-esteem. Render positive feedback for making decisions and engaging in self-care. Success promotes confidence in abilities and a sense of control. Recognition and positive reinforcement for self-care are great motivators for heightening self-esteem and feelings of self-governance.